Some links in this post are Amazon Affiliate links. If you click these and make a purchase from Amazon, I will receive a small commission at no extra cost to you. One thing I love about teaching is that the list of ways you can improve is a mile long. It truly never gets boring. But because the work of a teacher has so many dimensions, it’s easy to get overwhelmed; you can’t possibly do it all. So instead of trying to tackle everything at once, I recommend you pick just one thing. Consider an upcoming time frame when you’ll be away from your regular teaching duties, like summer or spring break. Then decide how much of that time you actually want to focus on meeting a goal—after all, you might just want to catch up on your DVR or do some travelling. If you do want to set aside some time to improve your practice, just pick one thing and focus on that. Start by figuring out where you really need work: I have created an exercise called the Gut-Level Teacher Reflection that will help determine what areas of your practice need the most attention. Go ahead and take that, and once you’ve decided on some key areas for improvement, it’s time to set your goal. 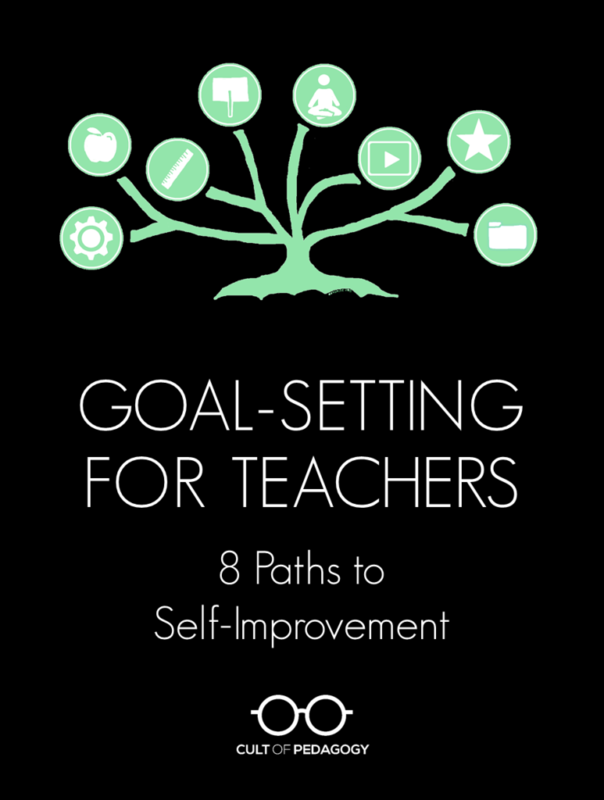 To help you, I have put together a list of eight possible paths you might take toward self-improvement as a teacher. Become a Google Educator. This is something I plan to do later this year. It’s a certification that basically marks you as having a solid foundation in Google’s online tools. You earn it by working through a series of free online courses that prepare you for five online exams. Four of these are based on your knowledge of Google Apps for Education (Google Docs and Drive, Sites, Calendar, and Gmail), then you choose one elective exam (options include Chromebooks and Google Chrome browser). Becoming a Google Educator is the first step toward becoming a Google Certified Teacher, which is a much bigger deal and involves on-site training for just a small group of teachers every year. Learn more at Google for Education Exams and Certifications. Complete my JumpStart Course. JumpStart is a self-paced, 10-module course designed to get moderately comfortable tech users to the next level. I designed it to mimic the same way I learned, a process that took me from being a basic Word-Facebook-PowerPoint-email user to being really, really comfortable with technology. Learn more about the course here. Attend an Unconference. If you want to keep it simple, you might want to just focus on exposing yourself to new tools. A fast, fun, and inexpensive way to do this is by going to an “unconference,” a grassroots professional development gathering organized and run by teachers. These are often called EdCamps or TeachMeets, and though they don’t exclusively focus on technology, most seem to lean pretty heavily in that direction. Learn more about attending an EdCamp or TeachMeet in your area. No matter how long a person has been teaching, there’s always room for pedagogical improvement. Whether you’re learning new theories, brushing up on the basics, or just adding a new technique to your arsenal, improving the way you actually teach should be a recurring feature on every teacher’s to-do list. Add some new teaching strategies to what you’re currently doing. To learn one fast, take a look at my collection of instructional strategy videos demonstrating techniques like concept attainment, reciprocal learning, the Jigsaw strategy, and lots of others. Learn more about learning. For our summer book study of 2015, I chose the book Make it Stick: The Science of Successful Learning by Peter Brown, Henry Roediger, and Mark McDaniel. This book digs into new research about the way people learn, and why so many of our common educational practices just don’t work. The final product of our book study was a 7-part series of video reflections by me, plus a podcast interview with the author. Another excellent book would be John Hattie’s Visible Learning for Teachers, which is reviewed here. Improve the way you differentiate instruction. If you’re like most teachers, you think you could be doing a better job at differentiating. Check out my Starter Kit for Differentiated Instruction, a collection of articles, videos, documents, and tools that will help you improve in this area. Do a classroom management book study: You could choose something very practical, like Harry and Rosemary Wong’s The First Days of School or Robert Marzano’s Classroom Management That Works: Research-Based Strategies for Every Teacher . Or you could go more holistic, focusing on relationship building and communication. Two books I absolutely love for this purpose are How to Talk so Kids Can Learn by Adele Faber and Elaine Mazlish, a fantastic guide to adjusting your communication style with students, and James Sturtevant’s book about building relationships with students, called You’ve Gotta Connect: Building Relationships that Lead to Engaged Students, Productive Classrooms, and Higher Achievement. Take an online course in Classroom Management: Two affordable online courses you can take are the Pro-Active Behavior Management Webinar, created by Angela Watson of the Cornerstone for Teachers, which is designed for elementary-school teachers, or Classroom Management 101, offered by Linda Kardamis of Teach 4 the Heart, which would be ideal for teachers in grades 4-12. Listen to Episode 18 of my podcast, where I interviewed activist Anthony Cody about how teachers can get more involved in educational activism. Download a copy of my Education Activist’s Starter Kit, a comprehensive list of resources to help any teacher learn how they can start taking action. Find a group of like-minded colleagues and make a plan that includes learning about the issues and participating in one of the many events around the country and online that are pushing for saner and more effective educational policies. Read a teacher mindset book like Angela Watson’s Awakened: Change Your Mindset to Transform Your Teaching and you’ll notice a big difference in the way you process the daily challenges of teaching. Pair that up with Watson’s newest book Unshakeable: 20 Ways to Enjoy Teaching Every Day…No Matter What and you’ll find yourself experiencing your work in a very different, and happier, way. Create a support group with other teachers who want to make the same kinds of changes in their own mindset. Read either of these books together and set aside some time to talk through the insights and questions that come up as you read. Build mindfulness practice into your regular routine, which will help you reduce stress, feel more purposeful, and actually become more productive. Meena Srinivasan’s book, Teach, Breathe, Learn: Mindfulness In and Out of the Classroom, talks about the value of mindfulness practice for teachers and includes a mindfulness curriculum you can use with students. Chances are, you probably use PowerPoint or Keynote to create slide presentations. But are you familiar with best practices for slide creation? Most people aren’t, and that means the world is chock-full of heinously ineffective slideshows. To start improving yours, get a copy of Garr Reynolds’ book Presentation Zen: Simple Ideas on Presentation Design and Delivery. By reading just a few chapters, you’ll start to understand exactly what needs to change about your slideshows, and you’ll be motivated to fix them. To organize your time, try Google Calendar. It took me a little while to learn it, but now I keep all of my important events, daily tasks, birthdays, everything on it. And what I love is that it’s also synced with my phone, so I get reminders on the go as well. To get your classroom in order, you absolutely must check out the incredible collection of classroom organization tips from the Clutter-Free Classroom website. How are you growing as a teacher? I would love to hear about the goals you’ve set for yourself as a teacher. I’m sure I left some things out (actually, as I was finishing this up I realized I completely forgot building content-area knowledge), so let’s keep building this list together. In the comments below, tell me about a past goal you’ve set for yourself as a teacher, and how successful you were at meeting it. Or share a future goal and tell us what your plans are for reaching it. Love your website, blog, everything, including the t-shirts. I have been placed in Kinder next year, after having taught 2nd and 3rd for many years. I have no training in the CCSS for Kinder, no knowledge, no inkling about anything that has to do with munchkins. Can you point me to some resources? I will ask for recommendations from my contacts in K. If anyone here has ideas, please share them! Jennifer–Love this post, and want to say every newsletter you share helps me on my personal path of growth as an educator and a colleague! (It all started with the “Marigolds” !) This article is perfect professional development! Thanks, Donna! Are you going to try one of these this summer? This is amazing! I feel as if this was written just for me, and I love how you’ve provide a link to all of the resources you recommend. Thanks, Joanne! I’m really glad you found it helpful. Hi Carlyn — Are you referring to updates from this blog? If so, go ahead and sign up for my mailing list and you’ll start receiving weekly emails from me. Just go back up to that gray box and click on either of the red links. Thanks! Great blog I enjoyed reading it thanks. Old Focus: How the audience is perceiving you. This creates a lot of anxiety. New Focus: How you can serve and help your audience and deliver value to them. I got this advice from reading Garr Reynolds’ Presentation Zen, which is still the absolute best thing I have ever read on presenting (and I mentioned it in this article above). These goals are absolutely fantastic. Clear, practical, high-quality advice. Thank you for putting them together, and for including resources which you know to be of value. I’m so glad to hear this, Katharine! Thank you. Excellent post with great resources for educators. Thanks for sharing. I plan to highlight your post in my next blog! I enjoyed reading your other posts as well. Thanks for being a positive voice in education. I wish I had read this post back in June! I’ll still share with my colleagues, better late than never! Thank you 🙂 As for my own goals, I read 8 books to use in my classes, picked excepts and talking points and started a blog about it! Hooray! I find this piece very useful to my 2016 goals. Thank you for the recipe, and I will always share with my colleagues here in Nigeria. I find your dedication to helping teachers and students very honorable. Thank you a lot! I love your website! Thank you for your wonderful work. Is the “Teacher, Organize Thyself” resource available? Hey, Melanie! This is Debbie, one of the Customer Experience Managers with CoP. If you scroll down to #8 Get Organized, you’ll see links to the Google Calendar, Evernote, and Google Drive posts which were once part of that earlier series called “Teacher, Organize Thyself.” Hope this helps. I really don’t know how I got into this page but am so glad I need. I needed a teaching resurrection of some kind. You gave me a focal point again! This is one of the most comprehensive lists I’ve read. The great part about that is I can zero in on the specific ones that are just right for me. It’s overwhelming to think about goals for a new year and you’ve helped me pinpoint some very clear goals as well as attainable steps to reaching them. Thanks very much for the support! I just found you and just started listening to your podcast and I LOVE your resources! I write down all of the book recommendations that you make on many of your podcasts. Where do you find the time to READ all of these books? I’m currently a senior in college, and I found your blog to be very helpful for the learning communities. Although, my focus is on higher education I will definitely be coming back often to apply some of these strategies at my work place. Some of the goals I have set for this coming year are creating a support group at work for educators, get better with Twitter, and organizing my time as well as my projects early on. Thank you for writing such a great blog. Your tips will help me identify and set goals for the new academic year. What areas would you suggest for an elementary special education teacher (11 yrs) in a resource Room? Hi Karyn! This is Holly Burcham, a Customer Experience Manager. This is one of my favorite posts, and inspiring as it is, it’s a lot to take in! My background isn’t SpEd, but I’m thinking the goal-setting ideas in the post could really work for anyone in any educational setting–it really just depends on the area that you want to dig into a bit deeper. You could start by getting on Twitter or refining your Twitter skills if need be, or check out Evernote, see if you’d like to use that platform regularly. You could get familiar with either platform in an hour or two, and then figure out if you’d like to take them on more fully. If you’re ready to do a bit more, I’d suggest taking on one of the books mentioned here or dig through the Google Educator tutorials. Lastly, if you haven’t yet, try out the Gut-Level Teacher Reflection. What a marvelous blog you’ve shared!! I was just reevaluating my goals and craving for some stretch goals when I came upon your blog. It is refreshing, its forward thinking and has the potential to take me away from my comfort zone to grow and be my best self as an educator. Sincere thanks for sharing. I am just going through my future goals and found your user friendly website invaluable with many new ideas about teaching and learning. Thank you for sharing. Happy to have found this helpful website. Simply inspiring! This information is greatly appreciated by me as I am looking ahead at my 28th year in teaching! Hello Jen & thanks for your blog on teaching and teaching recommendations, tips. Much appreciated here as a new teacher in the field. I will definitely recommend this site to others in hopes they find inspiration for the love of teaching. Again, tks! I found all your blogs so informative and helpful for me as an educator. If only I have found out this website three years ago.. I believe I’m a total different educator now. Thanks a lot! By the way, can you help me out what good sources I can get in training teachers for the in – house training? Thanks much..
Hi Jennet! I’m Holly and I work for Cult of Pedagogy. By in-house training, do you mean staff/faculty PD that can be done in school? If so, I’d recommend checking out Hate PD? Try Voluntary Piloting, How Pineapple Charts Revolutionize Professional Development, and How to Plan Outstanding Tech Training for Your Teachers. Jenn also has a tech course called JumpStart which is worth a look. If I am totally off base, please write back! We’ll do our best to connect you with what you’re looking for. I am amazed with the suggestions you have provided. These are really the things I believe we need as educators in the 21st Century. I will be updating you how we go along with our training once we are done. Once again, thanks Holly! Hello! You identified great resources in regards to professional development. Have you found that schools are willing to pay for these PD opportunities, or should educators plan to set aside a certain amount of money to fund these experiences? Additionally, how much time do you believe a teacher should dedicate to professional development? I appreciate the different types of resources that you listed, including books, websites, and certification opportunities. Do you find that schools often provide these opportunities at the school, or do you seek these out on your own? Great questions — I’m sure it’s different everywhere, but my experience is that a lot of districts and schools have PD budgets both at the district and building level. I’ve also known teachers to use their own money to attend something they’re highly interested in that the district couldn’t support. And I’ve even seen PTOs financially support some PD opportunities. I don’t know that I’ve ever really thought about how much time a teacher should dedicate to PD…but teachers should always be working toward some sort of goal.